ASAR image courtesy the European Space Agency (ESA). The ESA provides additional imagery of the continued break up of the Wilkins Ice Shelf. Caption by Rebecca Lindsey. In late February 2008, a large part of the Wilkins Ice Shelf on the western side of the Antarctic Peninsula disintegrated. Since then, what remained of the southern part of the shelf has been held precariously in place by a thin ice bridge connecting Charcot Island in the north to Latady Island in the south. 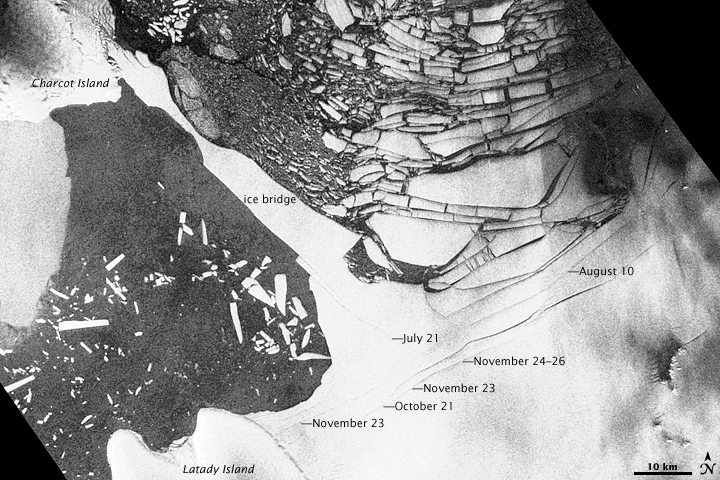 Initially, the ice bridge was about 6 kilometers wide, but further break up during Antarctic fall and winter reduced the bridge to just 2.7 kilometers. As Southern Hemisphere summer approached, imagery from the European Space Agency’s Advanced Synthetic Aperture Radar revealed that new cracks were continuously forming in the seaward edge of the ice shelf. This image from November 26, 2008, shows the location of numerous cracks and the dates on which they formed. (The large version of the image is not annotated.) 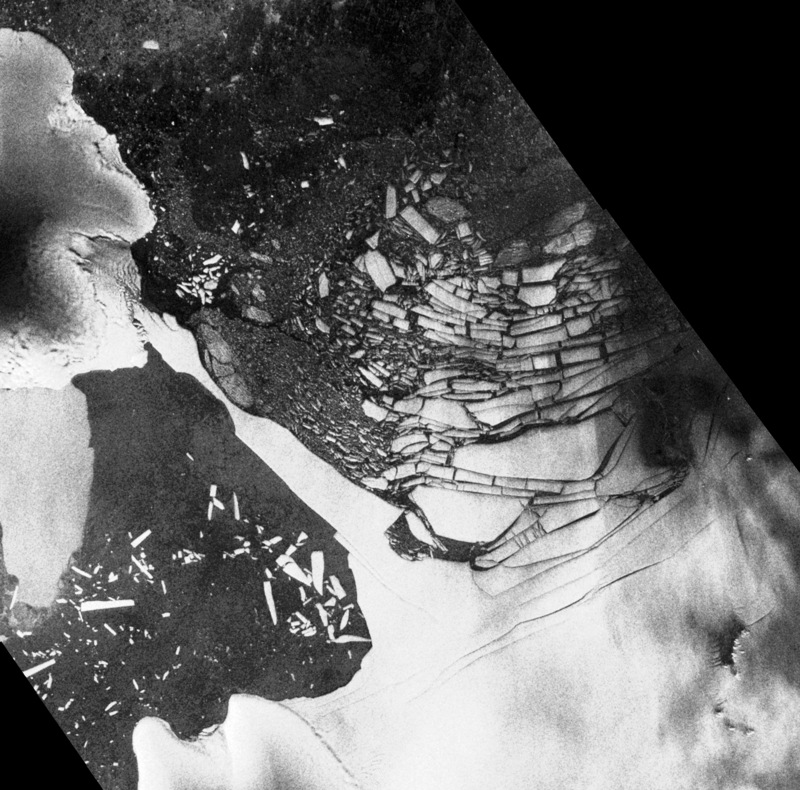 It seemed likely that the new cracks would dislodge the fragile ice bridge, which could destabilize the remains of the ice shelf that are wedged between Latady Island (lower left) and the Antarctic coastline (toward the right). The Antarctic Peninsula has experienced more warming in the past two decades than the rest of the continent. The rocky spine of land extends out of the Antarctic Circle into the Southern Ocean, and rising ocean temperatures have been implicated in the collapse or retreat of multiple ice shelves in the area. The Wilkins Ice Shelf is nearly 300 kilometers closer to the South Pole than the Larsen B, which rapidly disintegrated in 2002. Radar images can’t simulate the natural look of a photograph, but they have the advantage of being able to provide imagery even during darkness or bad weather. A radar sends a pulse of electromagnetic energy (the frequency of the energy can penetrate clouds) toward the surface and measures the intensity of the “echo” that returns to the spacecraft. Different surfaces reflect or absorb the radar pulse differently, making some surfaces bright and others dark. ESA News. (2008, November 28). Wilkins Ice Shelf under threat. ESA Portal. Accessed December 3, 2008.